The Solo Stove is the #1 wood-burning backpacking camping stove recommended by Backpacker Magazine. This stove has an ultra light weight compact design that is perfect for Survival, Camping, Hunting & Emergency Preparation. No need to carry any fuel with you as this stove uses twigs and other readily found burnable items that you find outside wherever you are! Having one of these small lightweight stoves could be a life saver. Forget about the stoves that use fuel blocks or canned fuel. You might eventually run out of fuel over time, while this stove only requires small twigs, leaves, pine cones, and wood that you find outside. The Solo Stove provides a very reliable and reproducible way to build fires for cooking and boiling water. Its relatively expensive but well worth it in my opinion. Consider getting the recommended accessories (see links below). The pot gripper allows you to easily handle the stove (and metal pot or cup) when hot. The Solo Pot 900 is made for this stove and will nest with it perfectly and has a rubberized handle on the lid. The Solo Aluminum Windscreen will totally shield your flame from the wind in windy locations. The Solo Alcohol Burner is a great backup fuel source when dry wood is not available and it can store fuel directly in it for extended periods of time without leakage. For packing, the Solo Alcohol Burner fits inside the Solo Stove which fits inside the Solo Pot 900. The following YouTube videos each provide a review and demonstration of the Solo Stove Wood Burning Backpacking Stove. "Fast and compact compared to other models I have tested." "Great little wood burner. I have tried many, and made some myself, and this one's my favorite. It's tough/durable, the dual burn is very efficient, and fits perfectly in my snow peak 900 pot." "Suddenly Cooking is Fun. I bought this stove because all I could find on YouTube and the net was positive. All true, and best of all, it's fun." "This is a great little stove. I did quite a bit of research on these before purchasing, and also considered making my own. It was clear that this stove at $70 was the best option. Right after I got it, I took it blind on a 3 night, 2 day 25 mile solo loop. The stove performed flawlessly. It is amazing how hot it burns when it gets rolling. Pro-tip: Use small fuel once it is burning - maybe 1"-1.5" pieces. When the fuel is above the air inlets, it tends to burn with a lot of soot. This was another concern of mine - dirty pot. However, if you just carry a stuff sack, it doesn't effect anything. The stove isn't the lightest, but where it does save you if fuel. No need to carry anything. I am curious to see how i fair on a soggy trip. I also bought the 900ml pot that nests the stove perfectly. It is very well made as well. Read the reviews - the quality of the stove for the money cant be beat here. Great product that appears to be made well enough to serve me for a very long time." "Best of the best. I was amazed at how quickly this stove fires up. It was delivered quickly and I use it in combination with the solo alcohol burner on those days when I can't find any dry wood. The combination is unbeatable...."
"The quest for a reliable, easy-to-use backpacking stove never ends, and I have the collection to prove it! But the Solo Stove is really impressive, and worth taking a look at....Workmanship is superb. 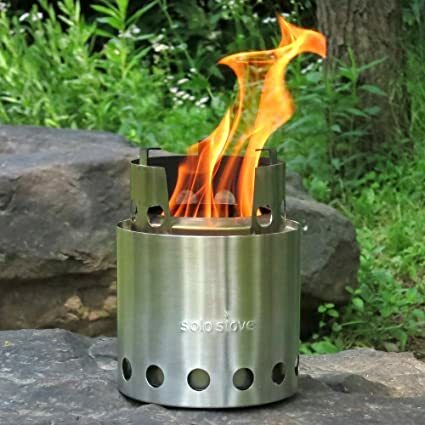 The Solo Stove is well-built and made of heavy gauge stainless steel with no seams, but it only weighs nine ounces. There are no parts to break or ports or vents to clog....Based on my testing so far, I really like the Solo Stove. With Coleman gas hitting over $9 per gallon here at the Walmart, fuel cost savings could be considerable. And the fuel is never going to get any lighter. A biomass stove that can take advantage of easily-obtainable fuel is something all of us backpackers should be looking at...."
"....It burns fuel that you can find EVERYWHERE and it does it very well. But you need to know how to start a fire. It also makes a lot of smoke when it is coming on line (once it heats up there is very little smoke) so you can't really have it "in" your tent or closed shelter...."
"First time I used it had water near boiling in about 8 min. I think by refining my wood selection I can get that time down." "Love this since there's no liquid fuel to pack, and it feels more like doing things on your own, but it does take some work. I like to cheat and use a fuel cube to get the fire started (alcohol-soaked cotton balls didn't work for me). Once started you need to keep an eye on it if you want to simmer, adding just enough twig pieces to keep the fire going but not so many that your meal boils over. It will get water boiling quickly once the fire is started. I haven't had any trouble finding twigs to use - they're usually all over since the twigs that fit this are too small to worry about for a campfire. You will want the pot that comes with this so order the set. I ordered this stove first but quickly realized I should get the pot as well - they fit together into the same bag (which leaves you the stove bag as an extra little convenience bag). I also recommend buying a pot gripper... for extra control of the pot *and* the stove. I use the gripper in the morning to shake out ashes for a quick breakdown. Once the ashes/coals are out this cools down very quickly. I stick it in the solo sack with the stove and the pot."